The Wii U is Nintendo’s sequel to the Wii. It is considerably more powerful than the Wii and supports HD graphics. Its main controller is the Wii U gamepad, which is motion sensitive and contains a touch screen. Is the Wii U an Add-On Controller for the Wii? No, although the focus on the distinctive controller lead many people to believe it was. The Wii U is to the Wii what the Xbox 360 is to the Xbox, an entirely new, more powerful console with a similar name. 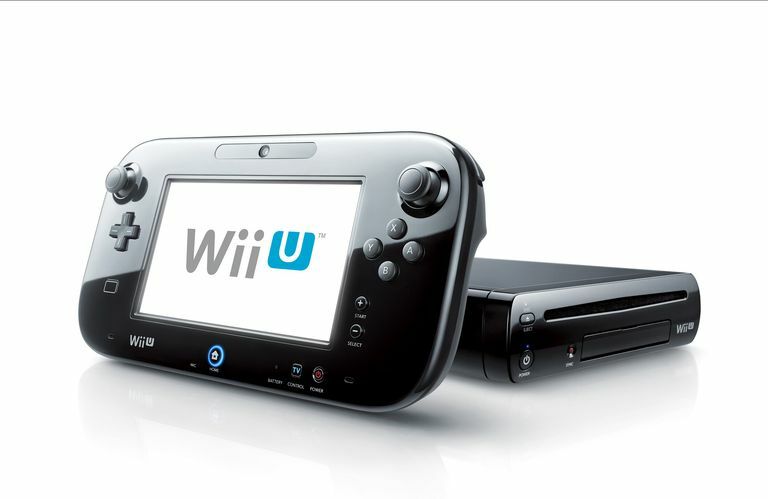 There are a variety of Wii U console bundles, with prices ranging from $300-$400 dollars depending on the bundle. Nintendo is always releasing new bundles, tying the console to particular games and sometimes changing what comes with them, so the actual price and what you get varies. The Smash Splat bundle is a good current one, offering two of the console's best games. How Can I Add Additional Storage? The Wii U supports external drives plugged into one of the console’s four USB ports, so you can have as much storage as you care to purchase. It can also read SD cards, but they cannot be used for downloaded games. What Do Wii U Games Cost? AAA titles like Splatoon go for around $60 when first released, although there are occasional sales. There are also many popular games and indie games on the eShop that can be as low as $2. What Are the Wii U’s Technical Specifications? IBM Power-based multi-core processor, AMD Radeon-based High Definition GPU, 2GB memory (half for the system, half for the games), video output from 480i to 1080p. Are Wii Games Playable on the Wii U? Yes. The Wii U includes an internal Wii player. Are Gamecube Games Playable on the Wii U? Can Wii Settings/Save Data and Downloaded Games Be Transferred to the Wii U? You'll need an SD card and an Internet connection to do it. Is the Wii U as Powerful as the Xbox One and PlayStation 4? No. There was a lot of debate regarding whether the Wii U was as powerful as the 360 and PS3, but once the next-gen competitors came out there was no real comparison. What Features Does the Wii U Have? Besides playing games, the Wii U supports a social network called Miiverse, an eShop, an Internet browser, and video chat. There are no subscription fees for any of these services. The gamepad doubles as a TV remote (although one with no mute button). There originally was a system called Nintendo TVii that integrated with your TV viewing, but that never caught on and Nintendo shut it down in August, 2015. What Controllers Are Used with the Wii U? The Wii U supports a dizzying array of controllers. Besides the primary controller, called the Wii U Gamepad, the console is compatible with an Xbox-style Wii U Pro Controller, the Wii Remote and the Wii Remote Plus and Nunchuk, and the Balance Board. What Is the Balance Board? The Balance Board is a weight-sensing pad that players stand or sit on. It is most popularly known for its use in the Wii Fit series. How Many Controllers are Supported for Multiplayer Games? Multiplayer games can support one gamepad plus four Wii remotes and/or Wii U Pro controllers, allowing five people to play together. In theory, the Wii U could support two gamepads, but there are no games that utilize that. How Close Does the Gamepad Have to Be to the Wii U? The Gamepad, which connects wirelessly with the console, needs to be within 24 feet of the console to operate. In many homes people find they can use it in the bathroom or bedroom, depending on where they are relative to the Wii U, and perhaps on what the walls are constructed of. Can I Play Games on the Gamepad if the Wii U Is Turned Off? No, the gamepad is essentially a dumb terminal, with all processing done by the console itself. The only thing it can do with the console off is act as a television remote. Does the Wii U Require MotionPlus-enabled remotes? No, it supports both the basic Wii Remote as well as the Wii Remote Plus and the MotionPlus add-on. Some games require MotionPlus support, others won't. How Do I Know Which Controllers Are Supported by a Game? A dark band on the jewel case back displays icons indicating supported controllers.